Samsung's ill-fated Galaxy Note 7 is once again being blamed for causing a serious fire. 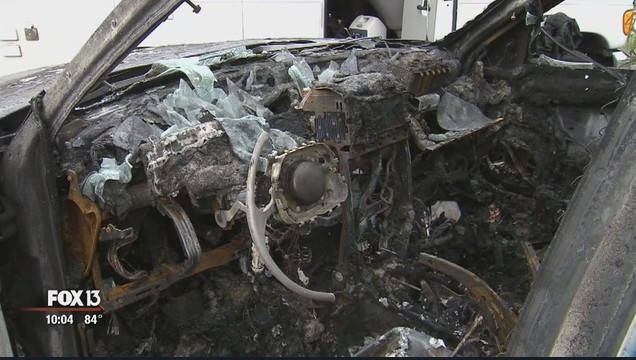 A man in St Petersburg, Florida, claims that while charging inside his truck, the phablet combusted and caused a massive blaze that totalled his Jeep Grand Cherokee. Lydia Dornacher told Tampa Bay news station Fox 13 that she and her husband Nathan were attending a Labor Day garage sale Monday morning when he plugged the Note 7 into the truck's center console to recharge. The family said that while they were away, the Note 7 caught fire inside the car. The blaze was discovered when the couple's daughter and family service dog returned to find the Jeep engulfed in flames. A St Petersburg fire crew was called to put the fire out. The Florida blaze is the latest incident to be blamed on the fire-prone Samsung Galaxy Note 7. The otherwise decent phablet has been recalled globally by Samsung for replacement due to multiple reports of its battery packs dangerously overheating to the point of catching fire. The Korean electronics giant says it will replace all of the recalled units with new phones less prone to spontaneous combustion. Owners in America and the UK can use Samsung's website to request a replacement. Meanwhile, US aviation watchdog the FAA has urged people not to fly with a Galaxy Note 7 that's switched on, charging or stowed in checked baggage.